I picked up first book of the vedic trilogy – Thunder God as a random read while I was on my mythological fiction marathon and I am really glad that I did. It was fresh and captivating. I searched author on social media and personally congratulated him for the book. I waited patiently all these years for the second installment because I knew it will worth the wait. 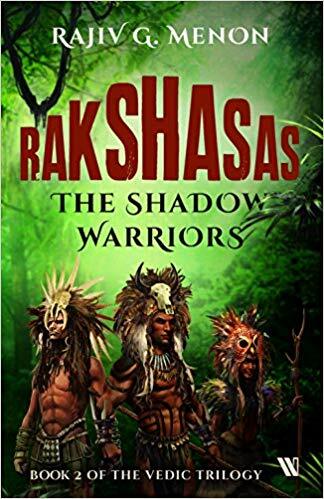 I started reading Rakshasas as soon as I laid my hands on it and finished it in probably 2-3 sittings. First wave of happiness arrived when I realized that the writing style of author is more refined and upgraded than the previous novel. First few chapters clearly set high expectation in terms of writing style and plot design. As I read further, story soared high with all essential elements of fantasy and then dig deep with mystery and thrill. I don’t want to divulge story of the novel but to discuss something unique about this novel. Best part of the novel is the beautiful imagination author put in while writing this novel. Nevertheless, foundation of the story is based on characters and event from ancient Indian tales but author took liberty of filling the gaps with figments of his imagination. This particular style created seamless story line, without any constraint of facts and logic. In general, contemporary authors pick up bits and pieces of mythology, do some research and write a novel around it. However, in this case author extensively used his imagination to spun a story and mythological elements effortlessly merged into novel, creating Rakshasas. Demography of Rakshasas ranges from ancient Indian history to Sumerian, Babylonian and Assyrian history, treading path of ancient science, magic, war, politics and mystics along the way. Parallel string of stories started independent of each other intertwined in the middle and finally connected with each other in the end. Aggression of Asura empire, politics of Bharata, melancholy of Indra and other Devas or vengeance of devastated Vidyutkesha, all these stories have their own grandeur. There are two things which I didn’t like in this second installment of vedic trilogy. First is gap in Indra’s story which kind of break continuity between first and second part of the trilogy and second is story of saptrishis which had significant plotline in first part – Thunder God. I will now patiently wait for the last installment of vedic trilogy.